the heart of the Highlands of Papua New Guinea, was getting ready to bring the evening devotion to the Nazarene missionary community. He was interrupted by news of an injured young boy in desperate need of reparative surgery. There had been a fight among enemy family lines at the road junction market area and 11-year old Masa, a young man who did not belong to either line, had got caught in the crossfire. He had been found under the tea bushes on the other side of the road with a machete wound in his back. A Christian man mercifully carried him to Kudjip Nazarene Hospital. 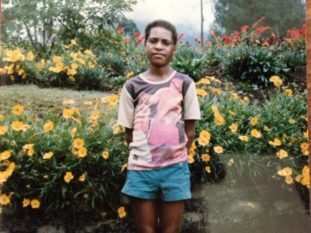 Life in the Highlands of Papua New Guinea is hard and often dangerous for its people. Tribal warfare and revenge killings ravage the interior of the country. Through Nazarene Health Ministries, Kudjip Hospital has been resetting broken bones, stitching wounds, diagnosing diseases and providing essential health care to its inhabitants for over 50 years. Jim Radcliffe rushed to the small hospital’s operating theatre. Surgery was begun immediately. There was no discernible blood pressure. Anesthesia was not needed since Masa was comatose. There was intense bleeding but the source could not be found. They did find a huge blood clot at the back of the abdomen. Out of desperation the doctors stopped and prayed asking God, “Where do we go?” The team turned their eyes back to the exposed internal abdomen of young Masa trying to follow the trail of blood. Charlied Gray immediately discovered the severed renal artery. The affected kidney and blood clot were removed and Masa was stitched up and sent to the ward. Masa stayed unconscious for 3 days. The staff prayed constantly for his recovery. They recognized that God had already gone before them. Jan Watson, who is a nurse and serving at the Highlands clinic, had been led by Him to pursue anesthesia training while on home assignment when there was not yet a doctor assigned to the clinic. Without her aid during the surgery, young Masa might not have lasted on the table. When Masa regained consciousness, the hospital chaplains and staff were able to piece together his young life. The hospital chaplains and medical staff shared the Good News of God’s love and redemptive plan with Masa. The healthcare professionals at Kudjip are about so much more than the physical needs of its patients. When the paralytic man was brought to Jesus, He first forgave his sins then healed him. He was concerned with the state of the man’s soul. So are the doctors and Kudjip and always have been. Just a week following the surgery that restored his life to him, he was released. At home in his village, he made a decision to follow Christ when two single missionary women of the Evangelical Brotherhood Church visited him. He started going to school, entering first grade at the age of 11. Later, as a young man, he attended vocational school studying animal husbandry and carpentry along with Bible classes. During this time Jim Radcliff and his family stayed in contact with Masa, visiting him in his village. Masa began to lay preaching in new-start Nazarene churches. He married a young woman named Elizabeth. They had 2 boys and an adopted girl. 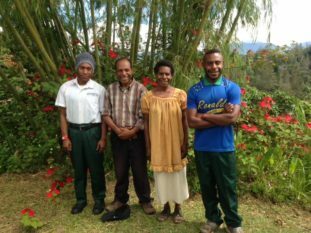 Masa had his ups and downs on his spiritual journey but the continued support of the Radcliff family has helped him to stay the course. Today his two boys in 10th and 12th grade are at the top of their classes and are active in the church. Masa is pastoring a church restart in an area that is plagued by heavy tribal fighting. In October 2017, masa after several years of study was ordained as a pastor in the Church of the Nazarene. 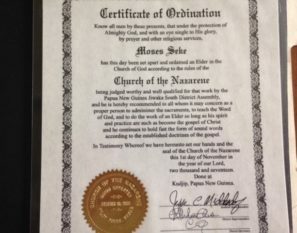 For an unknown reason, his ordination certificate gave his name as Moses. As the General Superintendent laid his hands upon Masa he prayer that Pastor “Moses” would save his nation. Masa was very inspired by this name change and claimed it as his own. So Masa, the young boy who had been in the wrong place at the wrong time, not knowing where to go in life has a new name and a purpose – to save his people from the bloody conflicts that nearly took his life by sharing God’s love with them.